Two gorgeous gasteruptiid wasp species found in Antrim Park, Columbus. Gasteruptiidae wasps are some of the most peculiar among the parasitic wasps. Larvae of gasteruptiids are predators (eat the host) or predator-inquilines (feed on the host and the host’s food storage, also known as kleptoparasites) in nests of solitary bees and wasps. Females lay eggs in the host nest; the hatched larvae may feed on the host’s eggs, larvae and on their food stores (Zhao et al. 2012). 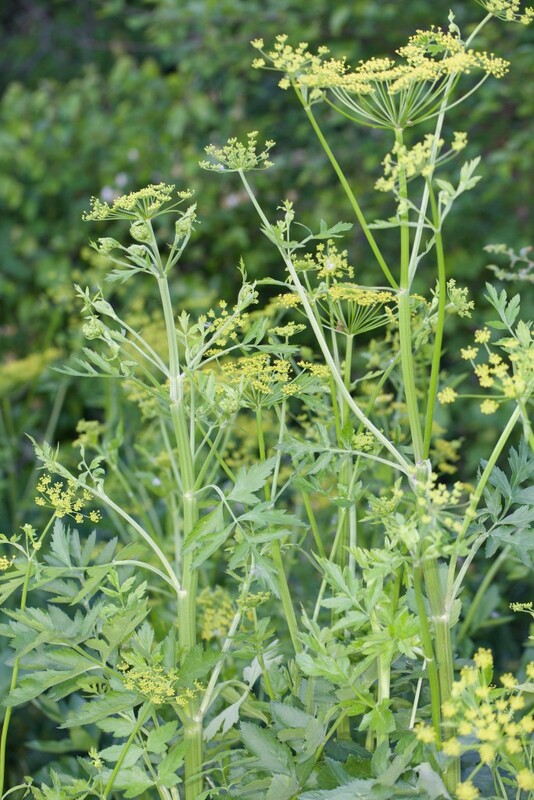 Adults are usually found around the nesting sites of their hosts such as dead tree trunks and clay banks, as well as on the flowers of plants in the carrot and parsley family (Apiaceae). 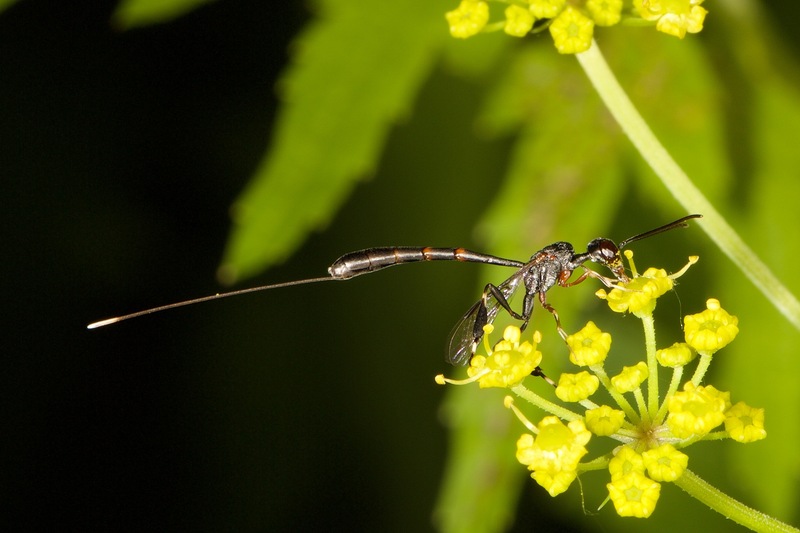 This small family of parasitic wasps in the superfamily Evanioidea (order Hymenoptera) contains only about 500 described species worldwide, although the real number of species is estimated to be 3-4 times larger (Jennings and Austin, 2002). To date, only fifteen species, all in the genus Gasteruption Latreille, have been recorded in North America (Smith 1996). So, I would expect these insects to be difficult to find around here and I would certainly not expect to find more than one species of these wasps visiting the same kind of flower at the same time. But, to my delight, Columbus always gets to surprise me! 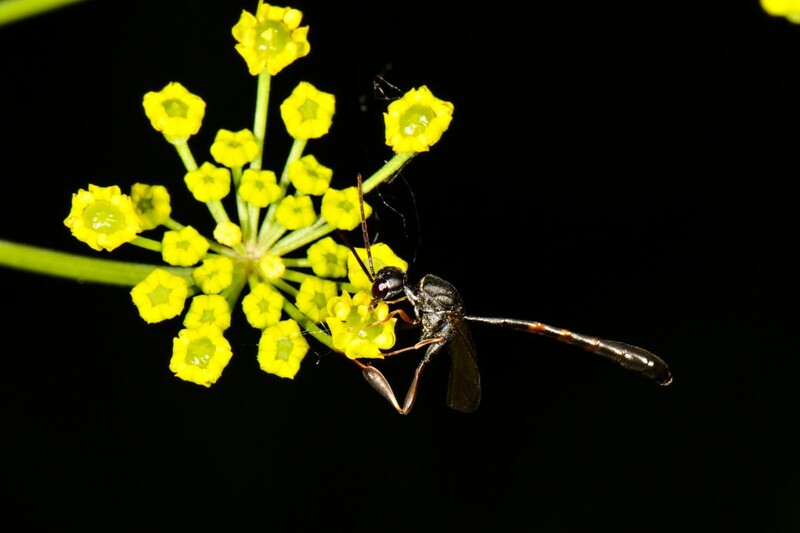 Just the other day, at Antrim Park, I found at least two species of these fascinating wasps visiting the flowers of a plant I identified as Golden Zizia (Zizia aurea), in the family Apiaceae. This plant, also known as Golden Alexanders, is a native prairie species that, in our area, will bloom from spring to early summer. You can observe these elegant gasteruptiid wasps too if you are interested. They are usually dark in color, contrasting sharply with flowers they feed on. 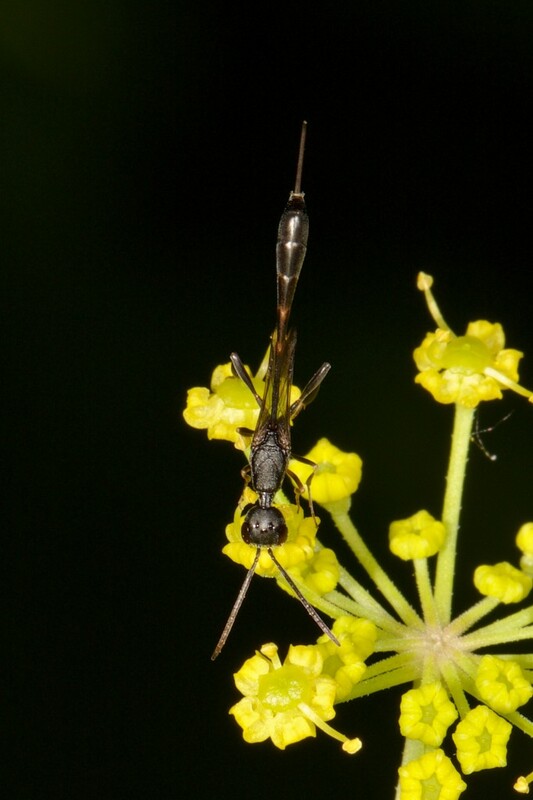 They are very easily recognized by 1) the slender and long abdomen that attaches high (dorsally) on the thorax, 2) the very long and thin ovipositor (not a stinger as these wasps do not sting), 3) the long “neck” that connects the head to the body, and 4) the swollen hind tibia. So, next time you are cycling or jogging along the Olentangy Trail, check out the flowering Golden Zizias and look at these gorgeous wasps. A female Gasteruption assectator (L.) foraging on Zizia aurea flowers. You can tell it’s a female by the presence of the ovipositor. A male Gasteruption assectator (L.) foraging on Zizia aurea flowers. A female Gasteruption sp. foraging on Zizia aurea flowers. A male Gasteruption sp. 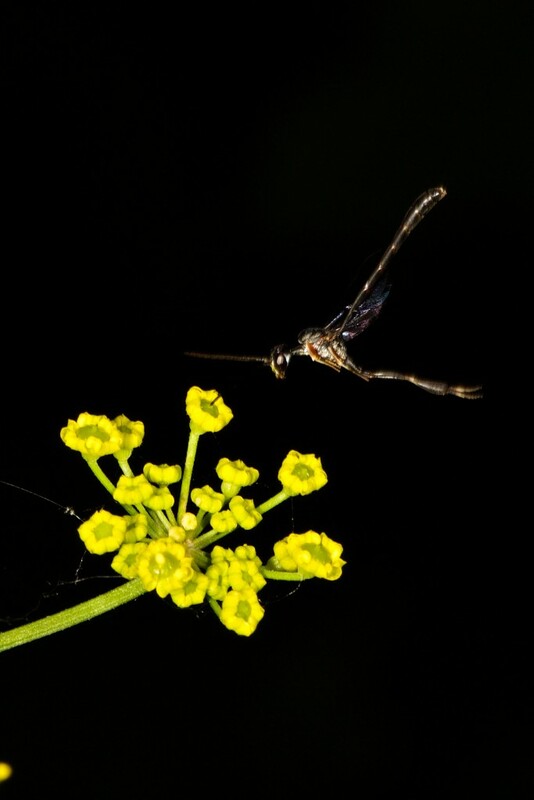 hovering around Zizia aurea flowers. Golden Zizia, Zizia aurea, blooming in Columbus. Acknowledgments: Thanks to Luciana Musetti, Curator, Triplehorn Insect Collection, OSU, for the help in improving the manuscript. About the Author: Huayan Chen is an Entomology graduate student in Norman Johnson‘s Systematics Lab here at The Ohio State University. He studies tiny parasitic wasps in the family Platygastridae (Hymenoptera), but is interested in all sorts of insects. All photos courtesy of Huayan Chen. For more insect photos taken by Huayan, please visit his Flickr site. Smith, D.R. (1996) Review of the Gasteruptiidae (Hymenoptera) of Eastern North America. Proceedings of the Entomological Society of Washington 98: 491-499. Jennings, J. T. & A. D. Austin. 2002. Systematics and distribution of world hyptiogastrine wasps (Hymenoptera: Gasteruptiidae). Invertebrate Systematics 16: 735–811. Zhao, K., van Achterberg, C., and Xu, Z. (2012) A revision of the Chinese Gasteruptiidae (Hymenoptera, Evanioidea). Zookeys 237: 1-123.